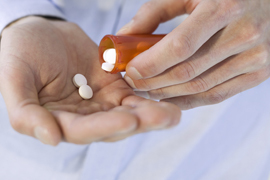 Pills or muscle relaxers can’t correct the nerve compression caused by a bulging disc. Sciatica is a distracting pain that begins in the lower back and extends down one or both legs. It typically worsens with periods of sitting or standing. The discs between the spinal bones of the lower back are often involved. Trauma can cause one or more discs to bulge. This crowds nearby nerves, causing irritation and inflammation. Coughing, sneezing or other kinds of movement can be painful. If neglected, the nerve irritation extends down one or both legs along the sciatic nerves. The pain appears in the leg, but the culprit is often the lower back! Click here to take this simple contracted leg test. Fortunately, improving joint motion in the lower back with a program of chiropractic adjustments has produced results for many people. It all starts with a consultation and thorough examination. If we think we can help, we’ll tell you. And if we don’t think we can help, we’ll tell you that too and refer you to someone we think can. Get started today. How do you get sciatica? It’s easy to trace some spinal problems to an event, such as a car accident. Yet, sciatica is often the result of cumulative damage. Years of bad posture, poor muscle tone, excess weight or countless other causes sets the stage. Then, something simple like bending over to tie your shoes can trigger an episode. Spinal decay can be another culprit. Instead of disc thinning that puts pressure on the sciatic nerve roots, arthritic bone spurs can intrude into the space normally reserved for the nerve. Actually, chiropractic doesn’t cure anything! Only your body can do that. The chiropractic approach to sciatica (and other health problems) is to help restore the way your spine works, reducing nerve irritation and revitalizing your own healing ability. How much chiropractic care will be needed? Most sciatica patients are delighted with the results they get after weeks or months of care. Naturally, this varies from patient to patient. After a relapse or two, many discover that years of neglect have produced spinal instabilities that never fully heal. These patients elect to continue with periodic chiropractic checkups. It’s up to you. What if I don’t remember any ‘trauma’? This is a common refrain. Because our bodies are unusually adaptive, we can often accommodate a variety of stresses for years. Finally, like the “straw that broke the camel’s back,” we turn or bend funny and suddenly our spine succumbs to the accumulation of stress.